Hip Baby Blog: Introducing Kate. We are so excited about this new bag from Timi & Leslie! It is made from easy to clean faux leather (PVC free) and features all of the functional accessories that you will need for an outing: a change pad (and a mesh pocket to store it), a zippered sac for soiled clothes, a small clutch so you don't have to bring your purse with you, an insulated bottle tote, stroller straps, key fob and 9 pockets for storage (3 exterior, 6 interior). When you are done using this bag for diapers it will make a great computer or weekend bag! 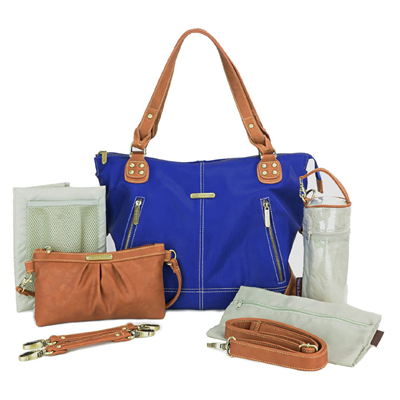 The Kate Bag comes in a variety of beautiful colours and is available online here.